Luxurious Wrought Iron Patio Furniture for your backyard to create a whole new look for your place of relaxation. Wrought Iron furniture is strong and durable but still retains its elegant look; iron is the prefect addition to your lawn furniture. Classic flair with a contemporary twist, this Balero Wrought Iron Patio Furniture unites both styles in a unique fashion. Its luxurious appearance along with classical lines is proof of the perfection in its design. The consistent forms and linear iron gray cast aluminum components set the mood. Absolutely weather-resistant and easy to care for, it will be a classic element for your deck or patio. Kettler's Balero Collection Wrought Iron Patio Furniture is handcrafted with timeless quality and tradition. Every piece has a unique and unusually smooth finish comprised of a thick compound that creates an elegant weatherproof surface that resists scratches, fading, peeling and chipping. This exclusive dark gray finish is eight times thicker than a standard powder coating and it is fifteen times thicker than a paint coating that possesses lasting quality and a flawless beauty that will be cherished for years without any particular care needed.. Additionally, testing has proven that this finish causes the iron to remain 50% cooler to the touch much longer after exposure to the sun than most traditional wrought iron finishes. You'll also find protective material on the fastener threads and soft feet. Each set comes with a finish touch-up kit. 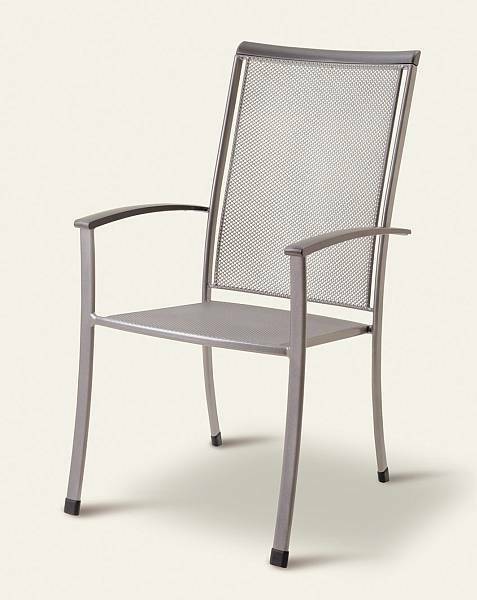 Each Balero Chair comes in an iron-gray finish and has a contoured design with solid stock legs. These chairs measure 23 inches wide by 22.5 inches deep by 39 inches high. The seat's height from the ground is 17.75 inches. The Balero Chair ships by truck in about 7 days.